Development and Economic progress of any country depends on its ability to meet the energy requirements of that country. United States of America by its fleet of naval ships and China by its String of Pearls are all trying their best to have control over oil supply routes through sea to ensure smooth supply of oil. India has realised that increasing imports and escalating oil prices are going to be a hindrance to the nations development. 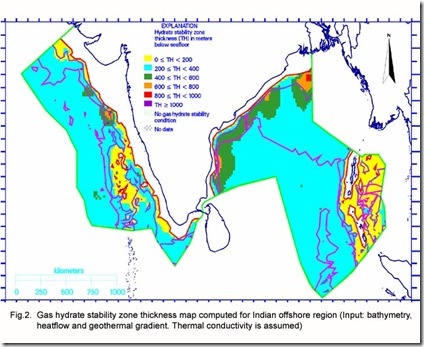 India has started looking for alternate energy sources specially extraction of gas hydrates from sea bed as the country is having a vast 7500 km plus coast line. Gas hydrates are water molecules in the form of solid with abundant methane molecules. Amazingly, 1 cubic metre of methane hydrate can hold up to 164 cubic metres of methane gas and 0.8 cubic metre of water at normal standard temperature and pressure conditions. This has already been identified by NIO. Here is the map. 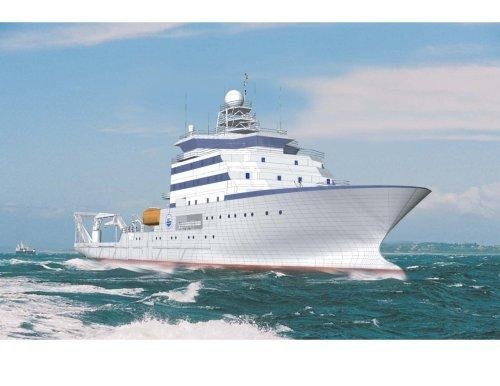 Sagar Nidhi, Italian built, 104 metres long vessel with Dynamic Positioning System and with a winch to hoist 60 tonnes from a depth of 6,000 metres has joined the fleet of Indian Research Vessels. Sagar Nidhi can also launch submersibles to a depth of 6000 metres for exploring the ocean. India has already developed a Remotely Operated unmanned Submersible which is 2.53 m long, 1.80 m wide with height of 1.70 m. This can carry a payload of 150 kg. Further India is going ahead to build a manned submersible to explore the oceans at 6000 metres depth. National Institute of Oceanography is competent to ensure extraction of gas hydrates. 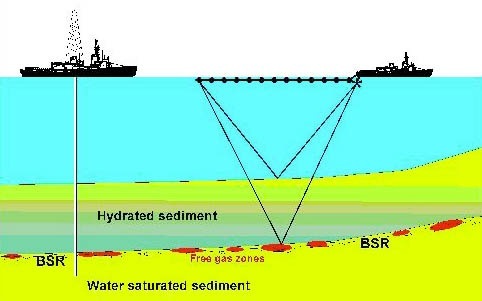 There is a fear that methane from the ocean floor will heat up the world’s climate to a far greater extent than coal, oil and natural gas do today.